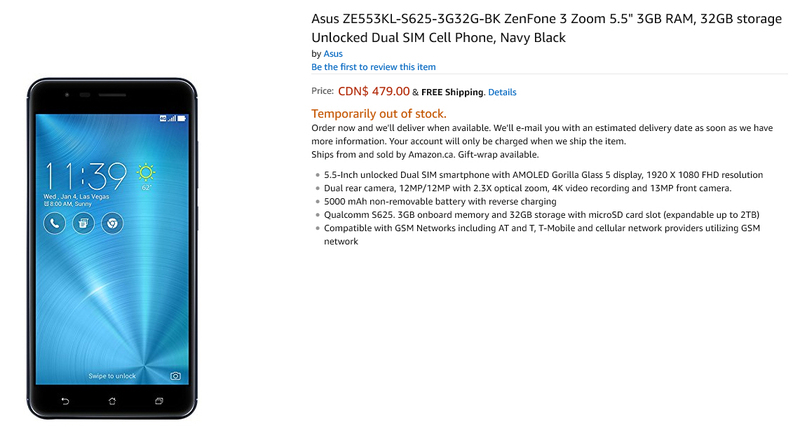 Well it looks like we’ve discovered the price of the Zenfone 3 Zoom (ZE553KL) in Canada. We see a pre order price of $479 CAD which means the price will like be right around $399 USD. As you may recall, the initial Zenfone 3 Zoom pre order pages had different prices from retailer to retailer. With those US listing now down, we have yet to see an actual retail price but count on the $399 USD as being the retail price. Part of this pricing may depend on the RAM and storage because the Canada SKU doesn’t match the US SKU that was spotted earlier. So a bit of a surprise here. We see this Canadian variant with 3GB of RAM and 32GB of storage. This is less than the Zenfone 3 (ZE552KL) which has 4GB of RAM and 64GB Storage. However, the less RAM and less storage is of minor consequence. You get a LOT in the Zenfone 3 Zoom that is simply with more. Breaking down this $479 price, the original Zenfone 3 (ZE552KL) retail price was $429 CAD at launch. It has since dropped in price. So for the extra $50 you are getting a AMOLED display which for me is worth the price of admission. You get the dual cameras and you get the whopping 5,000mAh battery as well. Yes less RAM and less storage which are not ideal but should be inconsequential when it comes to user experience. The microSD card slot is more than suitable. It could be said though that a cameracentric phone should never be equipped with 32GB of storage. I guess those AMOLED displays don’t come cheap because they are in such short supply these days. It’s interesting that the initial listings in the US showed a 4GB RAM and 64GB storage. Those listings have been removed so I’m wondering now if the Zenfone 3 Zoom has been dialed down a bit in terms of RAM and storage in both countries. It’s not clear if this configuration is exclusive to Canada or if the US will get a more esteemed 4GB RAM and 64GB storage. We should have those details very soon. Must say my patience is starting to wear thin. Zenfone3 Zoom was originally announced at MWC in early January, same time as the ZTE Blade V8 Pro. I ended up ordering that phone, and received it around January 26, and have been enjoying it for over 3 months already. But the phone that I really wanted is the Z3Z. I was disappointed to read that it had been delayed from Q1 to Q2, but none-the-less preordered it when it showed up [briefly] on B&H for $329 around late March. For anything close to that price the phone seems like a no brainer in terms of value, only lacking in the newer style Android buttons with backlight, waterproofing, and perhaps better speakers (dual front facing ideal). So being held over by the Blade V8 Pro, I’ve been patient, figuring the Z3Z would probably show up by May at the latest. Here we are into May and not only has it not shown up in the US, but I still can’t fine anything new about it, no release timetable, and it’s still missing from B&H etc after that brief preorder appearance. All I can find is a couple Malaysian reviews and now this possible Canada listing. At this point I am left to assume that this phone is basically vaporware, at least in the US. It a couple days it will have been FOUR MONTHS since its announcement at MWC and still there is no sign of when I’ll be getting it. Meanwhile with each passing month the phone gets “older” in terms of value in the market, as other devices continue to be released. Hoping for any further info from your site or anyone else.